Songs Inside The Box is a documentary film that takes viewers to the world's largest concert of cigar box guitar music and provides a unique glimpse into a popular hobby and growing movement of self expression participants call the cigar box guitar revolution. You’ll meet the King of the Cigar Box Guitar and some of his troops from the front lines of the revolution. They’ve made musical instruments from things most people throw away and they’ve written songs inspired by the twanging sounds their treasured boxes produce. Along the way, they’ve discovered secrets hidden deep inside themselves that they couldn't have tapped into otherwise. 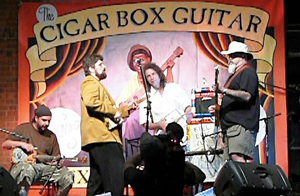 The Internet has connected hobbyists, amateur songsters, and professional musicians who share an interest in cigar box guitars and for one day each year they gather for a concert at the Cigar Box Guitar Extravaganza in Huntsville, Alabama. Scientists, surgeons, and salesmen all take the stage and express themselves through the songs they've found inside a little wooden box. 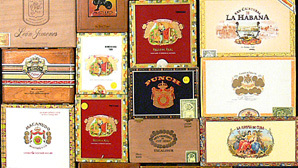 "I got me a cigar box... and got me a tune out of it. I kept my tune and I played from then on."